Not sure if this has been posted yet, but this is awesome! Seeing all the tweets about this event makes me happy! You can tell he put a lot of thought and planning to this. I was there! It was a lot of fun. Ended up staying for hours and hours -- until the end. This was the first time since his death that I participated in any kind of public event or gathering -- and let me tell you, it was such a relief! It was great to just dance and have a good time, celebrating his music, with hundreds of other people who also loved the guy. Oh and it was cool when Andre Cymone came out and spoke for a few minutes. Anyone else at this event? Oh wow! Andre was there - cool. What did he say? A lot of it was streamed live on Facebook. There are also nice videos on his FB page. He said he was with Prince every day for 6 years... he's still in shock about this; it was way too soon... he (Andre) makes really weird music and Prince always understood it. And he mentioned he's performing tonight at the Apollo. It was kinda hard to hear him actually and the crowd was being pretty noisey. But I was excited just to see him. And it's a little weird that he and Prince are the same age -- Andrea looks really hale and hearty. 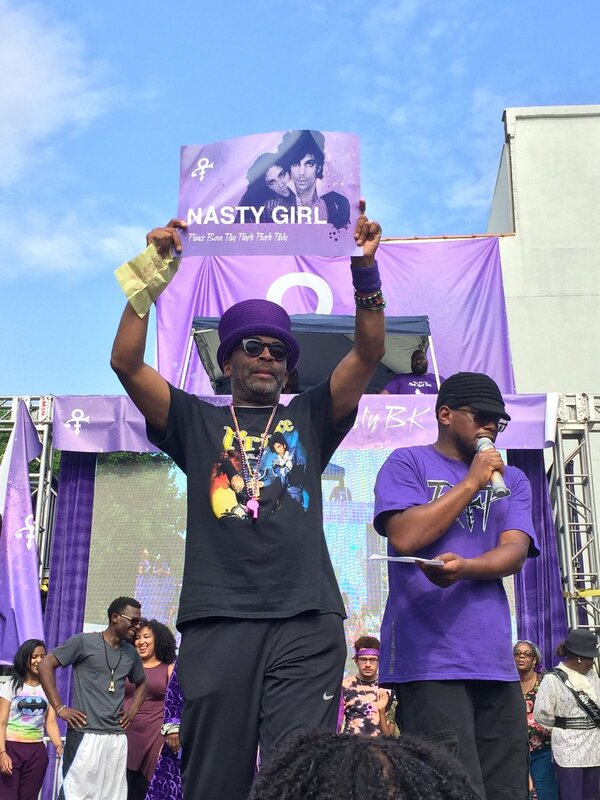 Let the rain come down, down"
I'm so grateful to Spike Lee for both the events he has put on since Prince's death. The service he's done for fans, and the reverence and love he shows personally to Prince and his memory at those events and in everything he's done since April 21, is really overwhelming. We all need to be together, and he knows that, and he keeps making it possible... and even, in the face of all this sorrow, he makes it beautiful. Spike, you are a mensch. Thank you. ...See the very first post in this thread. I watched most of it on Facebook. I thought it was lovely and really wished I could have been there, too. Thanks. I'm sure he's still in a lot of pain. Very difficult to lose a friend so soon. I know he will definitely protect the legacy of Prince. Forgot to mention that Spike brought Stephen Hill of BET up on stage. and he reiterated his promise to mount a tribute worthy of Prince at the upoming BET awards. Like a broken record I'll point out once again, clearly a few dozen things in those pics that would have been violations/banned/illegal under the ill-considered PRINCE Act legislation. Hope people remember this when it comes around again next session. Could I have paid $20 to enter? I could've, yes. But since it was free, many many people who possibly could not have afforded it were there. Do you think that event was free? That Brooklyn NY just said hey use our property because Prince? You have to have permits. Street closing permits. Alcohol permits. Sound permits. Who do you think paid for that? I was there. It was a beautiful occassion and as migmigmig mentioned not ONE commercial. Not ONE drop from the dj promo'ing HBO or any of the other sponsors. Not one mention of the sponsors OTHER Than their logos. MAYBE they shouted them out at the very beginning (which honestly would have only been fair), but I can't confirm that because I wasn't there at noon. It was a beautiful beautiful day. It was peaceful and all inclusive. And it was ALL free, outside of merch which once again duh. Saturday was super dope. Tomorrow is the end of the celebrating for a while and I will miss being with all of the purple family.